South Korean President Moon Jae-in will send a special envoy to Pyongyang next Wednesday to discuss plans to hold a summit with the North's Kim Jong Un and nuclear disarmament, Moon's office said Friday. 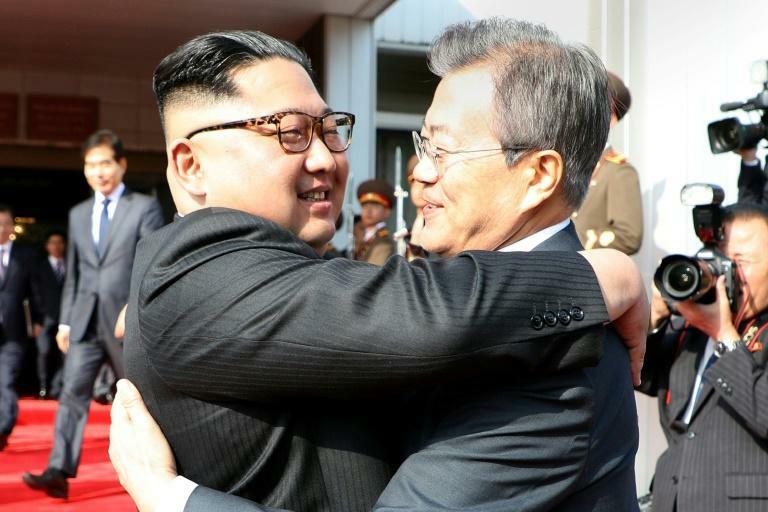 The unnamed envoy will visit the North's capital on September 5, Moon's spokesman Kim Eui-kyeom told reporters, adding it had not been decided yet who the envoy would be. Seoul proposed the envoy's visit Friday morning and Pyongyang accepted it a few hours later, he said. Potential candidates include South Korea's spy chief Suh Hoon and Moon's national security advisor Chung Eui-yong, according to multiple local media reports. "The envoy will have broad discussions over a detailed schedule for the inter-Korea summit, development of bilateral ties... and nuclear disarmament of the Korean peninsula," the spokesman said. It was the first time a North Korean leader had ever crossed into the South after the 1950-53 war that divided the Korean peninsula. They met a second time in Panmunjom as they scrambled to salvage a summit between Kim and US president Donald Trump in Singapore, which eventually went ahead. Friday's announcement came as US efforts to tame the isolated, nuclear-armed North have stalled for weeks. In June, Trump and Kim vowed to work towards the "complete denuclearisation of the Korean Peninsula", although their joint statement was short on details for how that was to be achieved. But Pyongyang has since slammed Washington for its "gangster-like" demands for complete, verifiable and irreversible disarmament, and the UN's International Atomic Energy Agency recently reported there were no indication that the North had stopped its nuclear activities. Last week, Trump ordered Secretary of State Mike Pompeo to cancel a planned trip to Pyongyang, saying he did not believe China -- the impoverished North's sole major ally and economic lifeline -- was helping in the denuclearisation process due to Washington's tougher stance on trade. Pompeo said Tuesday that Washington remains ready to engage "when it is clear that Chairman Kim stands ready to deliver on the commitments that he made at the Singapore summit... to completely denuclearise North Korea." According to the Washington Post, Pyongyang sent Pompeo a belligerent letter which prompted Trump to cancel the visit, though its precise contents were not revealed. Moon -- a dove who advocated dialogue to nudge Pyongyang to the negotiating table -- has persistently pressed for the resumption of cross-border cooperation, putting his administration at odds with Washington. Moon's office said last week it may delay the imminent opening of a liaison office in North Korea, after the abrupt cancellation of Pompeo's Pyongyang trip. The office, to be located in the North's border city of Kaesong, had raised concerns that the transfer of materials there could violate UN sanctions against the North imposed over its past nuclear and missile tests. "As the summit will be held at such an important time, it was decided to send the special envoy to have...more intense discussions," Moon's spokesman Kim said, adding Seoul and Washington were maintaining "close consultation."